Our blog readers may recall that last November, New York City Mayor signed Int. 1313-A, amending the Earned Sick Time Act. The amendments, which took effect May 5, 2017, allow employees to use safe and sick leave for the care and treatment of themselves or a family member and to seek assistance or take other safety measures if the employee or a family member may be the victim of any act or threat of domestic violence or unwanted sexual contact, stalking, or human trafficking. take other actions necessary to maintain, improve, or restore the physical, psychological, or economic health or safety of the employee of the employee’s family member or to protect those who associate or work with the employee. Employees are entitled to one hour of leave for every 30 hours worked. Safe and sick time will begin to accrue following the first day of employment or on the effective date of the law, whichever is later. Employees are entitled to use accrued leave 120 days after their first day of work or 120 days after the effective date of the law, whichever is later. 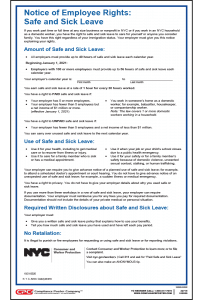 Employers who do not frontload safe and sick leave on the first day of a new calendar year must permit employees to carry over up to 40 hours of unused safe and sick leave from one calendar year to the new calendar year. The law also expands the definition of covered family members to include “any other individuals related by blood to an employee” or “any other individual whose close association with the employee is the equivalent of a family relationship.” Under the former Act, employees were only allowed to use sick time to care for a spouse, domestic partner, parent, child, sibling, grandparent, grandchild, or the child or parent of the employee’s spouse or domestic partner. All employers need to provide employees with an updated Notice of Employee of Rights. Employers are encouraged to display the notice where notices are customarily displayed; however, employers cannot post the notice instead of individually delivering the notice to employees. To order a copy of the notice, please click here.